I’ve ended up spending the evening rewriting my synopsis for Order For Burning, the theory being that I almost refuse to belief that I’ve spent a year of my life working on this thing without giving it a damn good shot. I had no returns the first time around so something needs to change. What did I come up with? Here’s what I got. Dumfries, South West Scotland, 1659. An air of tension hangs over this town, it is the height of the witch trials. In which rumour can quickly become accusation, accusation rapidly becoming trial. Agnes Cairns lives with her husband David on farm land outside Dumfries. They are both devoted to God and are friends with the local minister Robert. Robert carries out the public burnings for all women found guilty of being witches yet he has grown weary of this, beginning to doubt exactly what good this practice does. A young man called Andrew also works on the farm, helping David in the fields. Agnes’ friend Helen does not share the town’s appetite for the burnings, she stays well away from the crowds that gather around the town during the events. The story begins with a young girl found guilty of witchcraft and burned on the stake on the banks of the River Nith. After conducting this macabre showing Robert finds solace talking to David and Agnes. He reveals his concern that town rumour has suggested another local woman, Janet Miller, is concerned with the dark arts. Janet provides natural cure alls for the townsfolk on a very secretive basis. She is essentially the closest thing most of the people have to a doctor. Robert is placed with a difficult task as he is actually one of Janet’s customers. The Church notice Robert’s inaction on the matter and employ Jack, a man who has a record in finding witches and bringing them to the stake. Jack is very much guided by God and has a firm believe he is simply acting on the Lord’s instruction despite his use of torture to gain confessions from the women accused. Lacking anywhere to stay locally, Jack ends up lodging with Agnes and David on their farm. It us during this time that he meets Andrew and begins the process of taking this young man and making him his own apprentice in methods of torture. Andrew is taught the art of extracting a confession by inserting a metal rod through the skin and muscle of the shoulder and forcing it upwards. Convinced he is doing God’s work and glad of the prospect of the extra coin Andrew quickly adapts to his new role. Very soon Janet Miller is held in the local prison and, whilst undergoing this barbaric practice, confesses. This is before she gives Jack a list of names of women whom she shared her methods with. Two of these women are Agnes and Helen. Jack proceeds to attempt to turn the town against all those accused, saying they’re in league with the Devil. David begins to leave his religious beliefs behind as he tries to defend his wife. Before long Agnes and Helen are amongst the group of women held in prison by Jack and Andrew. Robert attempts to convince the town that they are innocent but it is too late as Jack’s words begin to take hold with the locals. Agnes however holds her ground and refuses to bow to Jack’s methods to get a confession out of the women. She stands up to Jack’s tactics and works out he’s simply a mercenary hiding behind religion. In a frustrated rage Jack visits David in the hope he can convince him to confess on behalf of his wife. When David refuses and slams the door back in his face Jack sets fire to the farmhouse with David still inside. Helen, not coping with the levels of pain and despair, reaches out to Jack asking if there is a way this can end. Jack arranges it so Helen can confess on the group’s behalf thus condemning them to the fires. In the following court hearing Helen is the only one excused as she is banished from Dumfries for the rest of her days. Nine women are sent to be executed on the Whitesands in Dumfries, Agnes amongst them. Upon seeing this Andrew struggles with what he has done. Jack receives his payment whilst the embers glow and asks Robert to direct him back to his horse. As Jack mounts his steed he is stabbed in the back by David who gains vengeance against the man who killed his wife. Robert witnesses this attack but takes no action, instead motioning for David to leave as quickly as possible. Order For Burning is a drama based on real life historical events. It’s detailed, possible too detailed but I feel much better about this than I did with the original a few weeks ago. I’ve actually gone back to relist it on Shooting People. Let’s see if we can get this kick started. I’m a little bit jealous it has to be said. You may remember a while back I blogged about Dave Cook and Chris O’Toole who were starting a Kickstarter campaign to get their comic ‘Bust’ up and running. I put £20 towards it because they were genuine guys delivering their story to a wider audience. This morning the printed copy of issue one dropped through my letter box and I have to report it’s brilliant. It tells the story of an America cut off from the rest of the world due to a disease that causes victims to turn into feral beasts. Jack is a card hustler before the fall and is welcomed into a walled off Austin, Texas which is governed as a dictatorship by Eddie Scott. Initially the two get on but a need for money to escape causes Jack to turn on Eddie. Upon discovering this Eddie forces Jack into gladiatorial combat as part of his plan to entertain the masses. It’s brutal but darkly funny in places too. I’ve often had stories stashed away that I thought would suit a comic book format but never pushed them forward. With Bust, Dave and Chris show the possibilities that are there. I look forward to further issues and, if this sounds up your alley, then you should jump on too at the Bust comic website. I’d highly recommend it. I’ve been in my current day job for ten years as of a couple of months ago. Last week an envelope arrives in the internal company mail containing a small badge and £100 worth of shopping vouchers. “It beats a bloody clock” said my Mother upon hearing this news. I didn’t want to spend them all in one go so I took them to the music and movie store round the corner from work the other day and ended up with this. 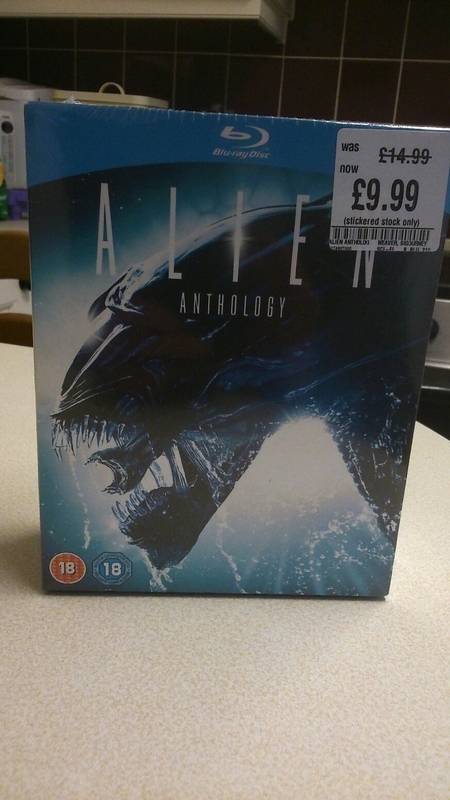 Firstly, £2.50 per movie is a good deal and secondly I’ve never seen any Alien movie all the way through. This happens with a lot of movies in that they’re so engrained in popular culture that you feel as if you have seen it even when you haven’t. Also, it’s a symptom of analysing individual scenes back in the media production days. So yes, I’ve seen the chest bursting bit, the construction mech bit, the movement sensor and that stupid baby alien bit at the end of Resurrection. None of them from start to finish though. It’s made me wonder why, when a movie is popular, we have a desire to take it to pieces rather than absorb the whole thing. So in between scripts I’ve been trying to do some of the smaller odds and ends I had floating around. Tiny little projects that would take a day or two to get done before I launch into another feature script which may take another year off my life. …oh how about I just let you read the bloody thing? It’s very first draft but then I won’t be going back to it to sharpen it up anytime soon so it would have just sat on a hard drive all this time. Read it, rip it apart, let me know what you think, share it as an example of how not to be Stephen King. It was a thin cardboard box, black with a yellow line around the outside. The price label still clung to the top half peeling off. Kevin looked at it, turned it over in his hands and placed it back down on the table. It didn’t look like the sort of thing that would be able to hold a ghost but he lacked anything else. The shoe box would have to do. The house had seemed welcoming at first. Kevin’s parents had taken him to look at it after school one evening. They had driven for ten minutes in a downpour up the hill on the outskirts of town. The driveway seemed to snake up the side of the hill, taking numerous twists and turns until they had reached the front door. Even with the rain water battering the windows it had seemed comforting. Kevin’s Dad had spent a while walking around the place, putting his hand on almost every surface and pushing it. ‘Plenty work to be done’ he had muttered as some chunk of wall had come away. They had moved in regardless and his parent’s had spent the time whilst Kevin was at school to redecorate the place. Each time he arrived home there would be something different, usually accompanied by instructions not to touch or be careful of his step. “We’re getting there” his Mum would say “It’ll look brilliant once it’s done”. Kevin had been given the room at the back. It was smaller then the rest but the window was large. In the mornings the light would stream in from the surrounding woods and glow around the room. It wasn’t the mornings Kevin had become concerned with, the nights are what had become difficult. There had been a black figure in the mirror, late in the evening. It had been fleeting, visible only for a few seconds and then gone in a moment. Kevin had often quietly crept towards the mirror to get a better look but there had been nothing there. A few nights later he was reading in bed and the figure had returned. Kevin slipped out from under the duvet and slid across the floor to see. The figure had not moved, it had stood like a cloud of smoke within the mirror slowly shifting. He did not know why but Kevin has felt the urge to hold out his hand and touch the reflective surface, to see if this was real. As his hand touched the cold of the mirror the figure had let out a scream unlike anything else. It was a drawn out rasp, a cat vomiting up a rattlesnake. Kevin screamed and jolted backwards, landing against his bookshelf to see the smoke grow. In a few short seconds it had taken up the mirror’s surface, covering it completely in an ink like darkness. Kevin’s father had burst into the room and the cloud had gone. When his Dad had looked he saw only his own reflection. The mirror was removed the next morning. The sound returned that night. From inside the wall and the floorboards below the hissing has started again. Undeterred the smoke began to drift underneath the door, coming in from the hallway. It filled the floor around Kevin’s bed before building upwards towards the ceiling. It began to fashion arms, wiry taloned twigs, out of each side before developing a gaping maw. Kevin had ran full force across the room nearly knocking the door off the hinges making his escape. “It’s an old house” his Mum had said by way of explanation “Perhaps it was just a shadow from the window”. Shadows do not scream, they certainly do not change shape and they cannot fill entire floors before rising upwards. Kevin looked again at the box as it sat on the kitchen table. His Dad was out, probably going to buy even more wallpaper, his Mum was busy dealing with the old paper as she peeled the faded yellow flowers off the walls. Grabbing the box off the table Kevin dashed down the hall holding the makeshift spirit confinement unit under his arm. His pace slowed as he navigated his way through the slalom of ladders in the hall. “Where are you going?” asked his Mum from the top rung. Kevin tried best to ignore her. Her face turned to curiosity, never quite crossing into suspicion. “Okay, as long as you’re not going to say you’re bored in ten minutes”. The mirror had been placed in the basement. At the time Kevin had insisted upon such a thing, to be as far away from his room as possible. At this moment however it was a source of regret. He slowly opened the door and fixed his gaze on the flight of stairs that led downwards. He placed his foot forwards, a loud wooden crack rang out through the walls as a cloud of dust fell downwards. Kevin stopped to check for any signs of movement downstairs. He saw nothing. After gently closing the door behind him he carried on downwards. The walls were covered with old shelving units holding pots of paint with the remnants of colour dried around the sides, wooden ladders stacked fence like on hooks and a pile of old newspapers with the dates worn away. A large dust sheet covered what was stood in the furthest corner. Kevin could see the stands at the bottom edge, his Dad had been careful to keep the mirror out of sight. Kevin carefully placed the box on the stone floor and stalked his way towards the mirror. His hand began to grip the cover, as he did the familiar scraping rasp filled the room. Kevin retained his grip but backed away quickly. The cover soared through the air before landing in a crumpled heap. The mirror’s surface was soon consumed by the black void. Kevin found himself gripping the box in his cold, sweating hands as the dark escaped the mirror and flowed out onto the floor. Once again this mass formed a tall figure, not drawn by pen more by knife slashes. The room now had a haze, as if plunged into a dream of which there was no waking up from. The mass fixed its wound like eyes at Kevin. The head of the thing tilted, considering this. Then came the voice like nails hammered into an ice block. “The one who was left”. There was no follow up. Kevin gathered himself together, heaving together the pieces of bravery he had into one pile. Before he could ask another question it emitted one of its own. Kevin thought for a few seconds. He’d expected this to be a battle, a struggle to contain this apparition. He had not looked into the possibility of it having questions. “I was brought here by my parents” replied Kevin. “The rest have not yet returned”. The silence after this Kevin accepted as a ‘No’. The form seemed to shrink and withdraw, there was a sudden despondency. “They said to stay here”. “Will they be back for you?”. Kevin made a dart across the floor with the box. If he was going to use it it would have to be now. He placed it on the floor. “You could go somewhere to find them”. The swirls still filled the room. “I brought this box, can you get in here?”. Kevin made a feeble pointing motion towards the open cardboard. Within seconds what looked like a miniature tornado appeared inside the box, the fog twisted and spun, getting smaller and smaller as it reached the centre. The box vibrated and moved along the floor but never left contact with the narrow point of the storm. Seconds later the fog in the room had lifted and all was still. Kevin reached out a foot and gave the box a light tap with his toes. Everything seemed normal. He picked the box up, holding the lid firmly on with both thumbs and resisting the temptation to look inside before running back up the stairs and out of the back door. He had wanted to bury the box, to dig a hole in the ground deep and leave it there with the Earth over it so he could forget it ever existed. If they did return however, how would they ever find it? He couldn’t stay in the house, of that Kevin was certain. Instead he walked down towards the tree which sat in the very bottom of the garden. It was a good distance from the house, good enough so Kevin was satisfied that the ghost wouldn’t return easily. The tree had formed into a snarled hand on the horizon over the years. Kevin placed the box gently, out of sight of the windows, before walking slowly back towards the house. If they came back, they’d find him there. Yes, it’s more pro wrestling chat from The Conquistabores. I always have a complete riot doing these podcasts and I hope that comes across in the final edit. The Conquistabores are back right here ON THE INTERNET but this time they come not to talk about one Pay Per View. Oh no. They’re here to talk about FOUR. Well, not all of four PPVs. Four matches, specifically matches for the Intercontinental Championship belt. The storied title, that has suffered somewhat over the last few years, has seen a fair few classic matches fought over it. But only one can be the best, which meant that Cameron, Phil, Euan and Geordie Al had to pick their best match, bring it to the podcast and lay down why they think it’s the best before a final victor is chosen. Thats right folks, fours matches will enter the thunder-podcast-dome but only one will leave. Will it be your favourite? Get to listening and find out in an hour and forty minutes or so. Enjoy!